One of the key components to elegance is often simplicity. An elegant science experiment is one that arrives at a significant conclusion using a simple, clever process. An elegant math proof is one that uses straightforward logical turns to simplify what seems to be a complicated concept. An elegant dress is classic, easy, timeless. An elegant dessert is . . . the cream puff. Dressed in chic black and white for our elegant occasion, of course. Cream puffs are the sort of thing people buy in tubs from the freezer section. I actually love those icy little things, but they pale (and shiver) in comparison to these homemade, creamy little clouds. The distinct taste difference isn’t the only reason you should make some cream puffs, though. You should make them because they’re easy. They look fancy, they’re classy enough for company, they’re impressive — but they’re easy! 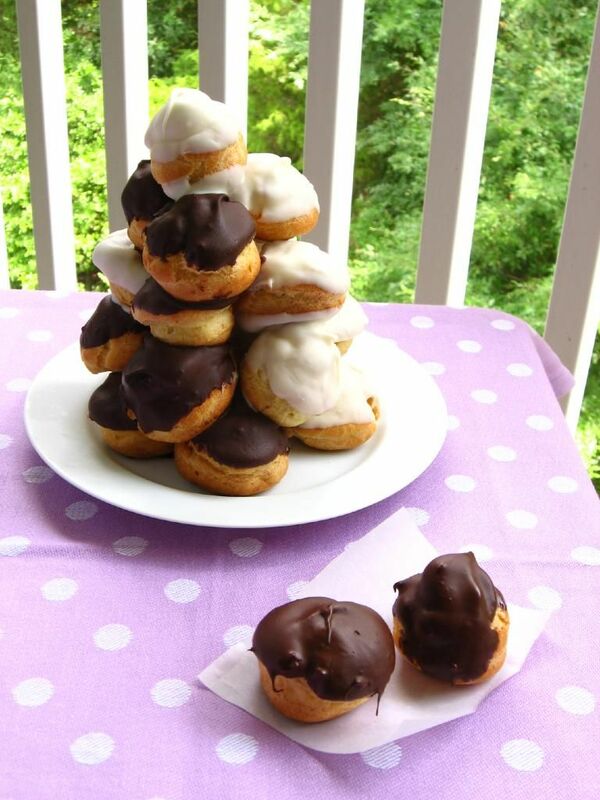 Not just the cream puffs, either, but the actual mounted cream puff tower (the croquembouche) is easy, too! If you can put some cookie-like dollops of batter in the oven, if you can pipe some cream, if you can dip something in chocolate . . . you can make this recipe. 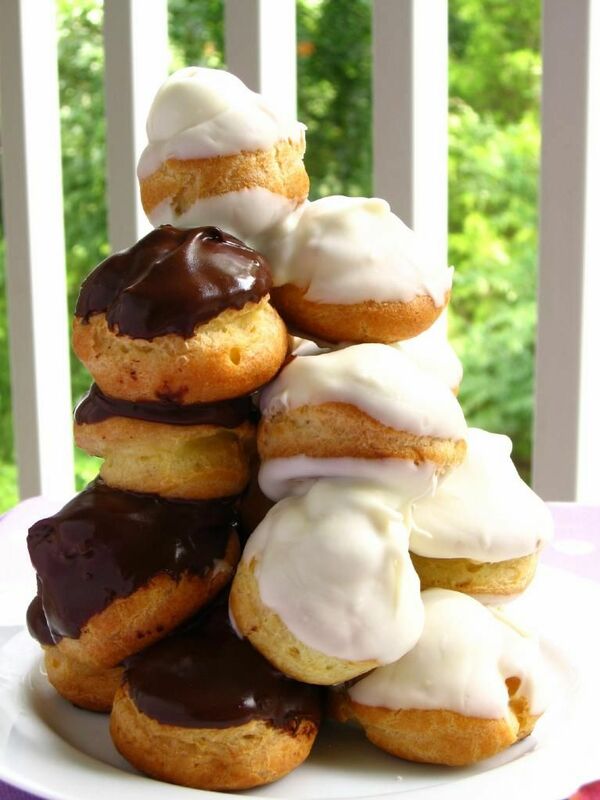 Cream puffs are made with a simple cooked dough called pâte à choux. It’s quick as a whip to make, and then it’s simply piped onto parchment paper, the little peaks are dabbed down with a wet finger, and the dough is egg washed. After a bit in the oven, the puffs are ready for action. I always make my puffs the day before and freeze them, baking them for a few minutes out of the freezer the next day and cooling them before filling (and serving immediately). It may seem odd to freeze the puffs for just one day’s storage, but they’ll get soggy otherwise, so it really is best. This here lovely tower of creamy puffiness is suffering from a delicious identity crisis. I opted for two flavors of puffs: puffs filled with vanilla cream and dipped in chocolate, and puffs filled with strawberry cream and dipped in white chocolate. They were both delicious and cute, but the consensus was that the vanilla cream puff was best. Feel free to make just one flavor, both flavors, ten different flavors — maybe even a rainbow croquembouche? You go for it! For my last croquembouche, I used caramel as the building glue. It stuck a lot quicker and was easier to work with in that way, but cooled off too quickly and became too viscous. This time I used melted chocolate, and had the opposite experience. It didn’t harden quickly and was a little shakier during the build, but stayed melty throughout the entire process. I think the best of both worlds is using chocolate but refrigerating the structure periodically to harden, so that’s what I’ve written into the recipe below. 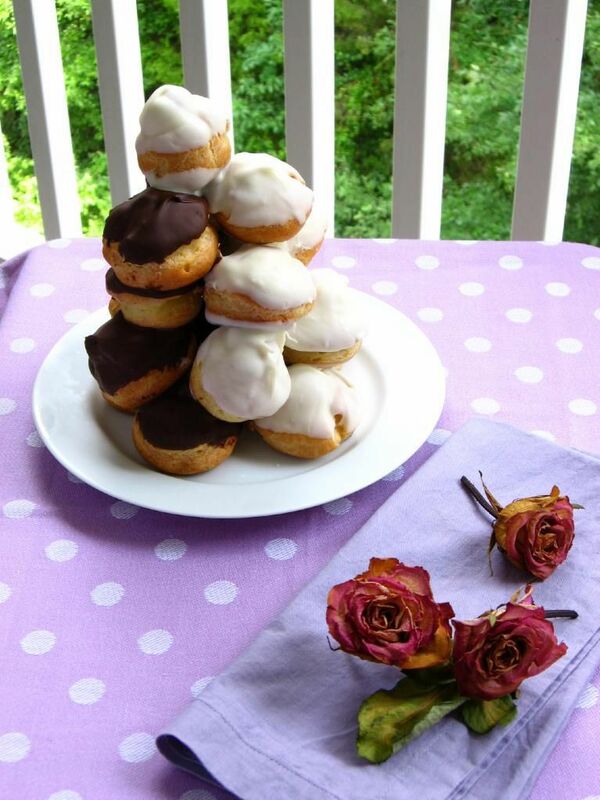 If you love cream puffs but are used to defrosting them first, it’s time to step out on a limb, get into your kitchen, and construct something beautiful! Tell me: what’s the most elegant dessert you’ve ever made? I love to watch this video from Martha Stewart anytime I begin a croquembouche, to visualize the process of making pâte à choux, filling puffs, and constructing the tower — take a look at it before you begin. Make vanilla pastry cream: In medium bowl, whisk together milk, egg yolks, sugar, and cornstarch. Put remaining 1 3/4 cups milk in a heavy, medium saucepan. Scrape in seeds from vanilla bean; add pod (or add vanilla extract here). Sprinkle remaining 1/3 cup sugar over the milk, letting sugar sink undisturbed to bottom. Set pan over moderate heat and bring it to simmer without stirring. Temper the egg yolk mixture by adding 1/4 cup of the hot milk mixture to it while whisking. Then, while whisking, gradually whisk egg yolk mixture into the hot milk. Cook over moderate heat, whisking constantly, until pastry cream simmers and thickens, about 1 minute. Remove from heat, discard vanilla pod (if used), and whisk cream until smooth. Transfer to bowl, removing half to another bowl for the strawberry pastry cream, and press plastic wrap directly onto surface (I let it cool a moment first). Make strawberry pastry cream: toss sugar with strawberries and set aside for 15 minutes. Then simmer them over medium heat for 10-15 minutes, until they begin to thicken a bit. Let cool. Add into 1/2 recipe of pastry cream set aside above and stir to combine well. Press plastic wrap directly onto surface of both bowls of pastry cream, chilling until cold, about 4 hours. After chilling, whip heavy cream into soft peaks. Add about 1/2 cup of whipped cream into each pastry cream to lighten. Now carefully fold the rest of the whipped cream into the pastry creams (about half into each). NOTE: Pastry cream can be made in advance and refrigerated, wrapped well with plastic wrap on surface, for up to 3 days. Make the pâte à choux: Combine water, butter, salt and sugar in a saucepan over medium heat. Bring to a boil and stir occasionally. At boil, remove from heat and sift in the flour, stirring to combine completely. Pipe the batter using a pastry bag and a plain tip. Pipe choux about 1 inch-part in the baking sheets. Choux should be about 1 inch high about 1 inch wide. Using a clean finger dipped in hot water, gently press down on any tips that have formed on the top of choux when piping. You want them to retain their ball shape, but be smoothly curved on top. Brush tops with egg wash while trying not to drip the wash down the puffs onto the pan (which could somewhat inhibit rise). Bake the choux at 425 degrees F until well-puffed and turning lightly golden in color, about 10 minutes. Lower the temperature to 350 degrees F and continue baking until well-colored and dry, about 20 minutes more. Remove to a rack and cool (tip from a pro: poke each puff with a toothpick while cooling to release the steam inside. It shouldn’t cause your cream to leak, but will help the puffs stay crisp). Can be stored in a airtight box overnight, but I recommend, if you aren’t using them right away to create your croquembouche, that you freeze them. When you’re ready to use them, bake them at 350 degrees F for 5-6 minutes to refresh and recrisp them. Fill your puffs: When puffs are cool, use a thin, plain tip to fill them generously with plain or strawberry cream (the strawberry cream will have chunks, so use a wider tip). Assemble your croquembouche: Melt chocolates in the microwave per packaging instructions (chips are usually melted on half power in increments of 30 seconds, stirring after each). I run a bit of hot water into a large bowl and set my bowl of chocolate down into the larger bowl to keep it melty, but be careful not to get water in the chocolate, which would cause it to seize. Dip each puff’s head into the chocolate (white or brown as desired), setting them right-side up on wax paper to dry. After you’ve dipped all of the puff tops, begin with the largest puffs, dipping the bottoms and/or corners as needed to build the base of your croquembouche on a plate. After building each level, stick the croquembouche into the refrigerator to harden the chocolate a bit before moving on. Sudden temperature changes aren’t ideal for chocolate and may change the color a little (though it didn’t for me), but I find this preferable to my tower collapsing! Once the tower is built, serve immediately. I refrigerated mine for a few hours and was fine with the texture, but it’s better served as quickly as possible so the puffs don’t get soggy. Enjoy! -Filling puffs with just one flavor of pastry cream instead of two. -Filling cooled puffs with simple whipped cream instead of pastry cream. -Serving puffs on a platter instead of mounted. -Only using one kind of dipping chocolate. Okay. These look amazing! I loved your last one but this just sent it over the edge! I wish there was a picture of the inside of one! Yum!! Thank you, Maranda! I should have taken a picture of how the cream explodes when you bite one 🙂 We ate them upside down so it wouldn’t all fall out onto the plate! Definitely elegant! 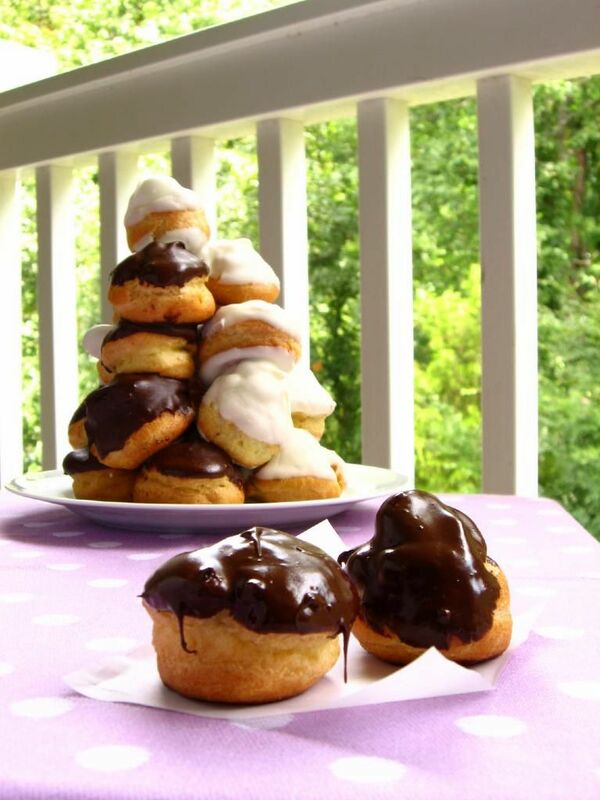 You said all the right things… it really is so easy to make cream puffs… and they are so worth it! Totally agree, Megan! I think they’re some of the fanciest, easiest little things to make for dessert. 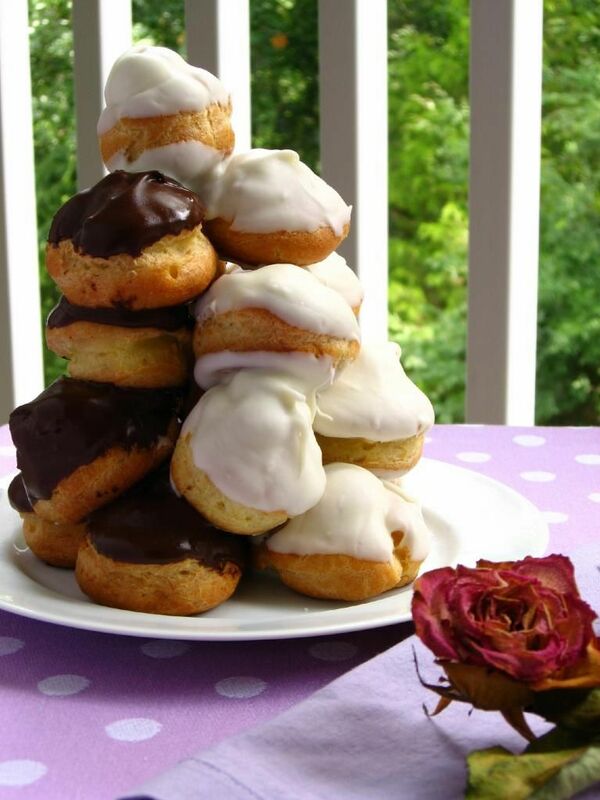 Nice job on your croquembouche! I did my first one ever about a month back and practically ate the entire thing myself. 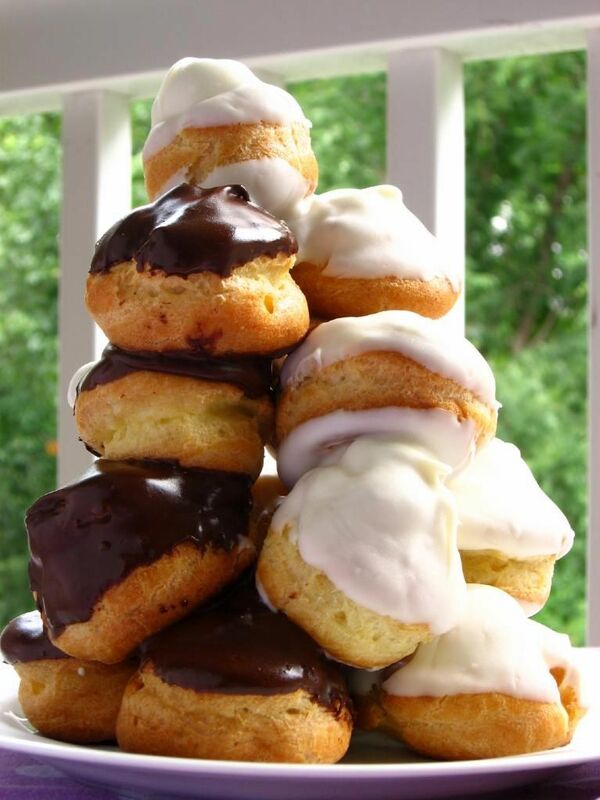 I love a good stack of cream puffs! Thanks, Julie! I usually eat most of the tower myself, too! Haven’t made these in ages. It’s a long story …. but it’s time to ‘get over it’ and move on. I pledge to make these soon as cool weather comes back. Aw, Mary, what happened?! You can do it!!! Simple yet elegant is exactly the way to go when serving guests. This reminds me a little of the leaning tower of Pisa…slightly unstable but miraculous in so many ways. Thanks, Monica; it really is simple! Those chocolate ones are my favorite — mmm! I did chocolate cream puffs filled with peppermint ice cream and iced with dark chocolate ganache last year for the dessert on Christmas dinner. It was lovely, imposing, and perfect in terms of weight and balance to the fondue bourguignonne we had just had. Mm, sounds like a feast! hmm…They look so nice. Im not so much into bakery but maybe I have to convince myself to change my behaviour. They look too good. Tomorrow I will go for it! Wow, this looks so great and almost like a small tree that is edible and tasty. This gives me an idea of making a green and red frosting for xmas time! don;t you think? it will be a great. That does sound nice, Pam! Thsi looks AMAZING! I just have one question about the Pâte à Choux – the recipe calls for 9 tablespoons of unsalted butter but is that melted butter? I know it melts anyway when it gets heated into the dough but I’m not sure how you measure it initially! Thanks, Cat! I just use measure it in stick form — so this is one stick (8 T) and 1/8 of a stick (1T). Beautiful! I’ve always been enamoured by croquembouche, and your black & white rendition looks so cute! Lovely. Absolutely lovely. 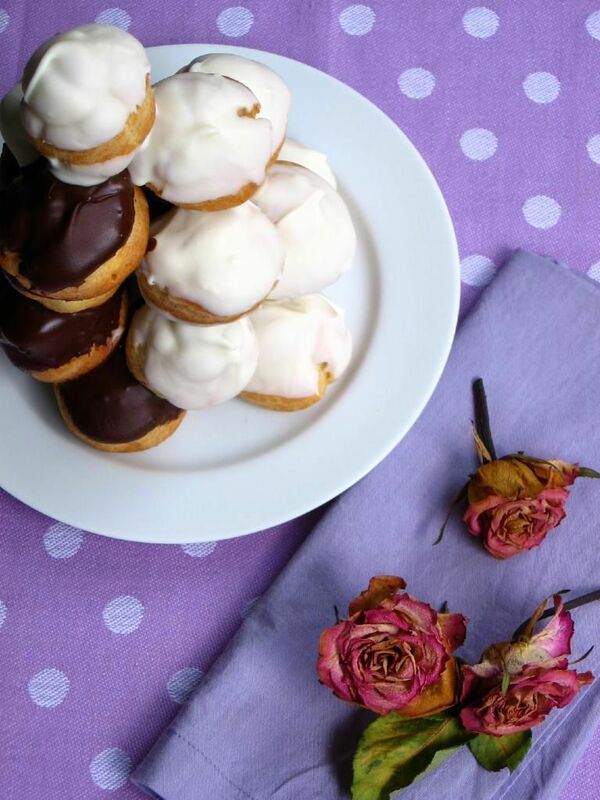 They look delicious, decadent and pretty straight forward – which is even better. Love the table cloth and props as always! 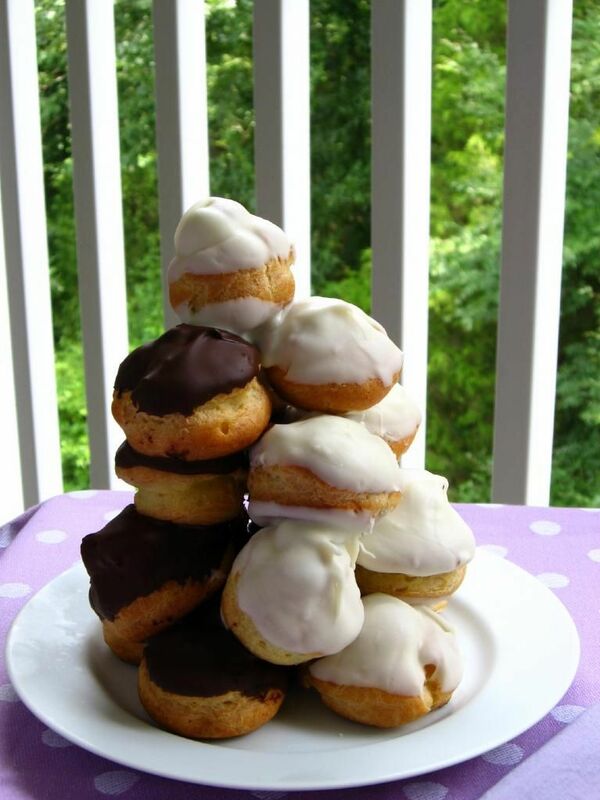 I first read about pate a choux on Michael Ruhlman’s blog late last year. I became obsessed with making it. I had more cream puffs than I knew what to do with. Then I made parisienne gnocchi and even replaced the bread crumbs in my grandmothers meatball recipe with it. They were the best meatballs I’ve ever made. 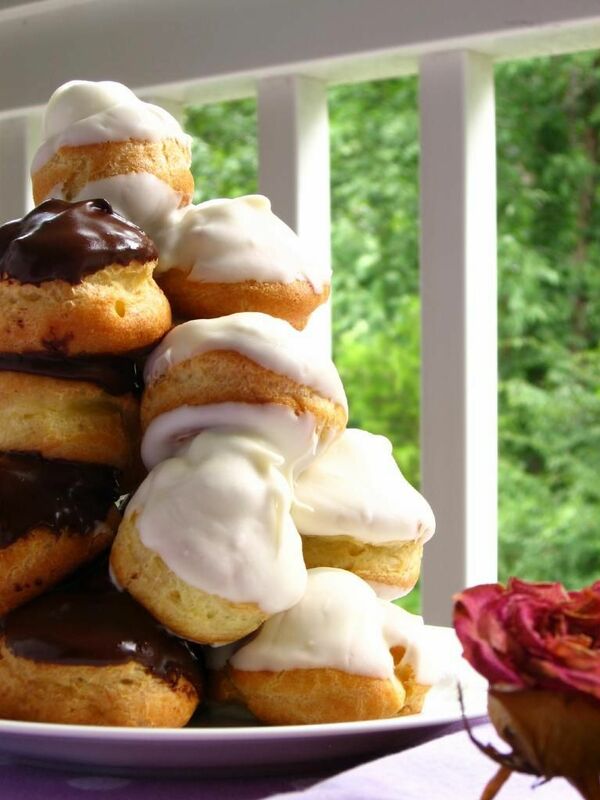 i always wanted a croquembouche for my wedding cake. 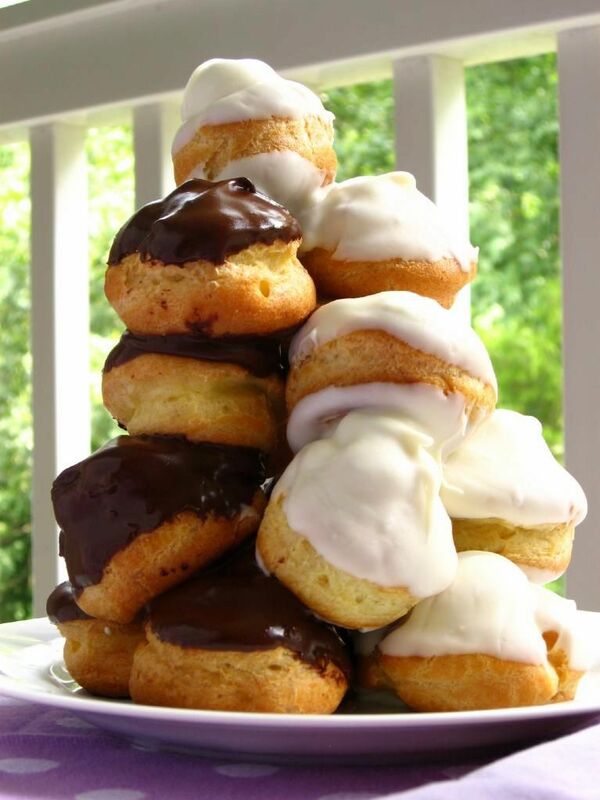 this would be the perfect new york croquembouche, an ode to the black and white cookie. love it! Hi! I’m making pumpkin cream puffs for a dessert competition tomorrow! However, I just found out that my partner can’t help out after today evening, so I’m thinking of using your freezing technique to keep the choux pastry fresh. Question: do you wrap the choux before freezing? Or freeze them uncovered? Definitely do the freezing! It’s so easy and keeps the pastries fresh and lovely. And definitely wrap them — double wrap if you can! You can wrap them in plastic wrap and then zip them up in a ziplock bag with the air squeezed out. Best wishes in the competition! Your entry sounds like a winner for sure!